Complete this form to download the Klaran Point-of-Use Water Disinfection Brochure. Crystal IS specializes in UVC LEDs that emit UVC light in the optimal germicidal range. These wavelengths are proven to be most effective at inactivating common pathogens (e.g. E. coli, MS2 and others) for consumer applications. Crystal IS UVC LEDs use Aluminum Nitride technology to provide industry-leading, cost-effective disinfection. 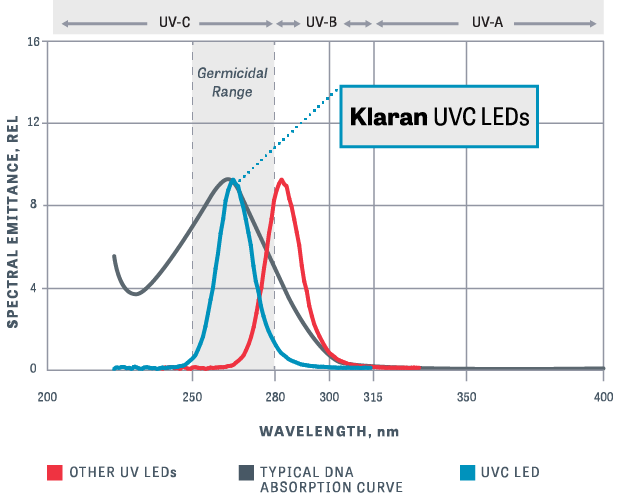 Built specifically for water disinfection reactors, our Klaran WD Series UVC LEDs provide reliable, on-demand performance for consumer and commercial water purification products.